this is the best hostel I have ever stayed at, really great way to meet new people and outher solo travelers. Everyone is super friendly, and the staff is extremely welcoming. 10/10!!! 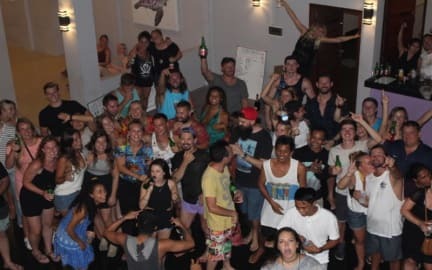 My Mate’s Place is easily the best hostel to stay in on Gili T. I was recommended this place by so many people and my expectations were definitely exceeded. Incredible vibes, great staff (shoutout to my girl Selena!! ), awesome party every night and the dorms/washrooms are super clean. This hostel is the place to be!! Potentially one of the best hostels I have ever stayed at. From management down to the staff, unbelievable 😁👊 Also to add Gili Trawangan is paradise. If you want to party, you can party. It you want to chill and relax, you can do. But choose party. This place is amazing, the guys that are in charge always make sure that everybody is playing, drinking and having a good time, they organize activities and the place is pretty close to everything. Thank you for a great time my mates! Solid hostel with fantastic clean and modern rooms, a little bit further from the main area than other hostels but not too much an issue. Staff were great. The real thing this place is missing is just a pool! They donated the money saved for a pool to the Lombok earthquake so it’s understandable why they don’t have one.